Natural massage oils contain vitamins, minerals and other skin-enriching substances that the body cannot produce on its own. Natural massage oils can be used alone or combined with other massage oils or essential oils for added benefit. 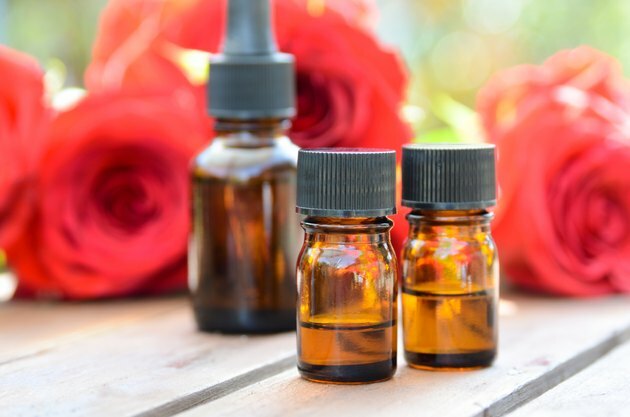 Choose massage oils that complement your skin type and allergy test them on small areas of your skin for a few days before you apply them to your entire body. Olive oil contains numerous health-enhancing ingredients including zinc, magnesium, calcium, iron and vitamin E, which is vital for skin health and may even discourage melanoma, according to Vitamins-Nutrition.org. Olive oil relieves body stiffness and is suitable for all skin types. Although olive oil can be used full-strength as a massage oil, it is best to dilute olive massage oil before use. Sweet almond oil is a light, non-greasy oil that is especially beneficial for dry, itchy skin. Sweet almond oil is a natural emollient or skin softener that aids the skin in retaining moisture. Sweet almond oil also contains anti-inflammatory properties and can be used full-strength. Borage oil contains vitamins, minerals and gamma linolenic acid, an omega-6 fatty acid that is vital to human health but is not made by the body, according to the University of Maryland Medical Center. Borage oil has stimulating, regenerative and penetrative properties. Borage oil is used for psoriasis and eczema treatment. Jojoba oil is a highly penetrating carrier oil that balances the body’s brain and pituitary gland. Jojoba oil contains antibacterial properties and is used to treat skin disorders including acne and eczema. Jojoba oil aids in breaking down the sebum, or skin oil that clogs pores. Jojoba oil keeps for up to five years and can be used full-strength or combined with other oils. Grapeseed oil is a non-allergenic oil that contains vitamins, minerals, linolenic acid and trace amounts of vitamin E. Grapeseed oil has restructuring, regenerative and moisturizing properties. Grapeseed oil is suitable for all skin types and can be used full-strength. Castor oil is a very thick and sticky oil that is used to cleanse the lymphatic system, break up scar tissue and draw out toxins. Use castor oil on scar tissue and on dry, cracked feet. Sesame oil is an anti-fungal and antiseptic oil that prevents premature skin aging. Sesame oil contains vitamin E, amino acids and lecithin and is suitable for all skin types except red and irritated skin. Sesame oil is used for rheumatoid arthritis and eliminates scabies, ringworm and other fungal skin infections.